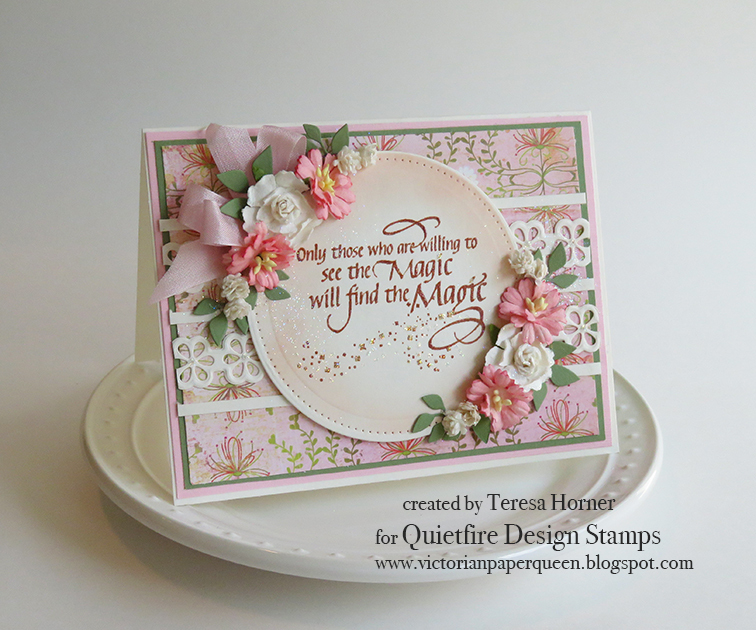 Hi Quietfire friends it's Teresa here with a brand new card i created using the Happy Birthday Clear set of stamps from the "A Way with Words" collection. 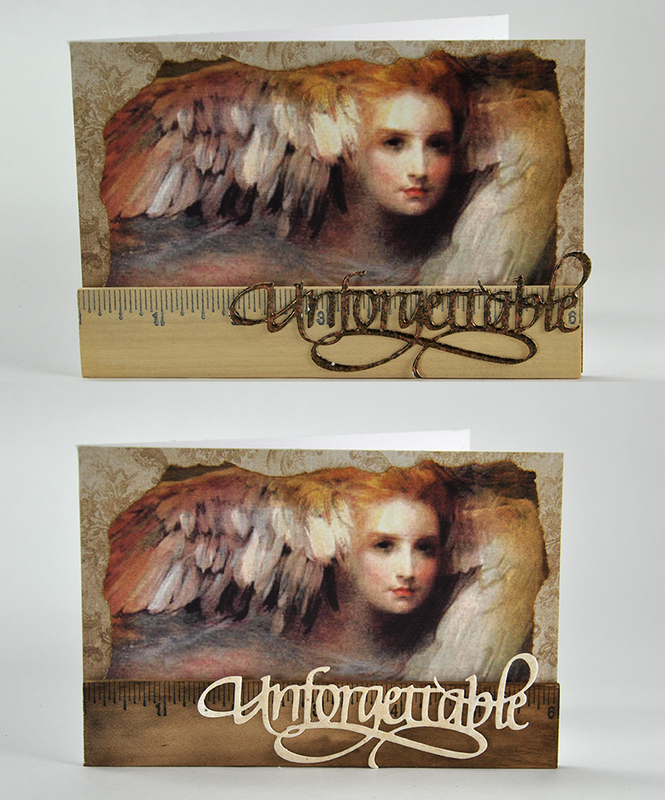 This set has lots of gorgeous stamps in it so it was really hard to pick. But there are always lots of birthdays in our family so i can always do more. The papers i used for my card are from a new line from Prima called Lavender. 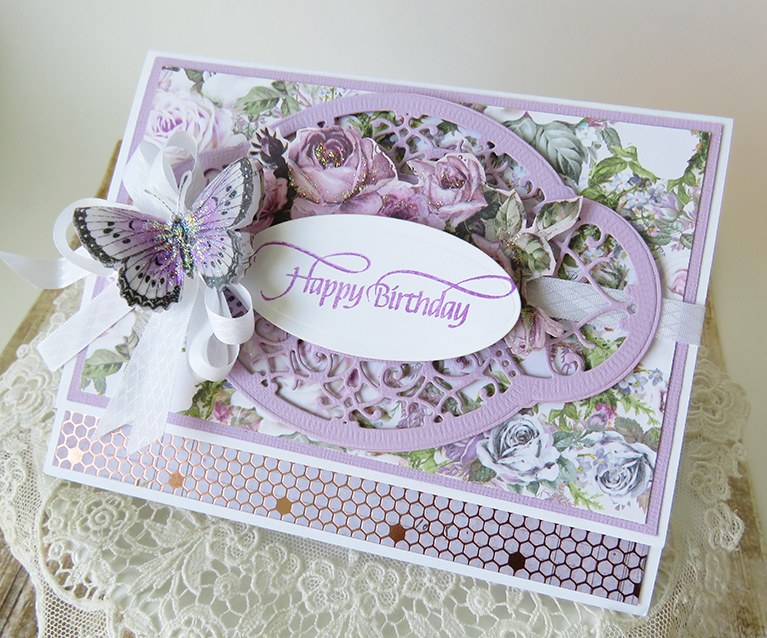 It's filled with gorgeous roses and butterflies and it's perfect to use for spring. 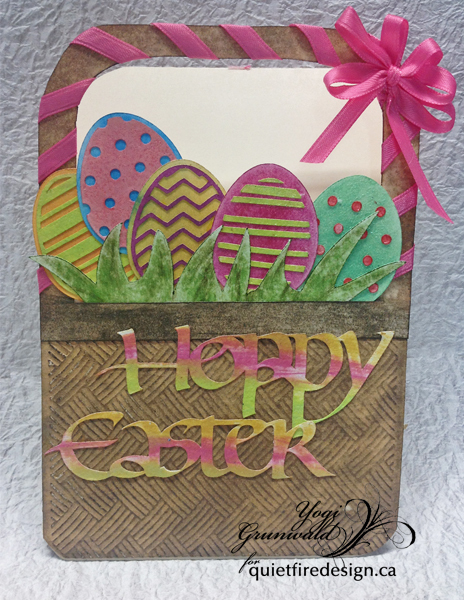 You could even pull out your favorite Mother's day stamp and use it too. 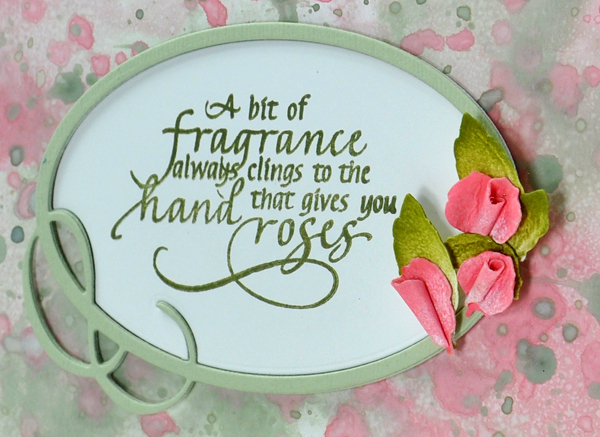 (Click HERE for mother's day stamp ideas). For my project I used the gorgeous Quietfire Design stamp "Friendship isn't a big thing". 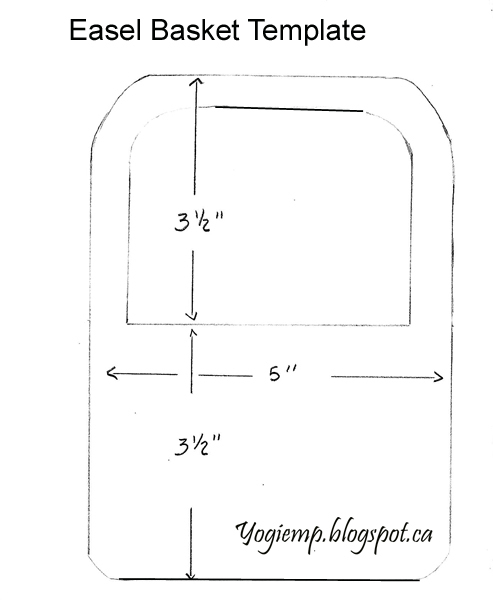 The frame is really easy to make....let's get started! 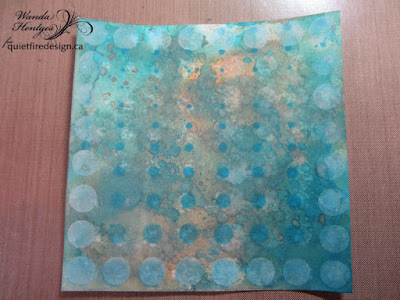 First glue a piece of (distressed) patterned paper onto a square canvas. Then stamp a sentiment upon white cardstock and then trim the cardstock to fit a little photo frame. Make sure the stamepd quote is centered. 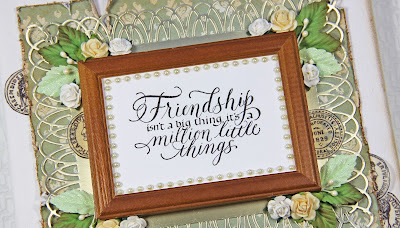 Adhere a strip of self-adhesive pearls into the frame and then glue the photo frame onto the canvas. 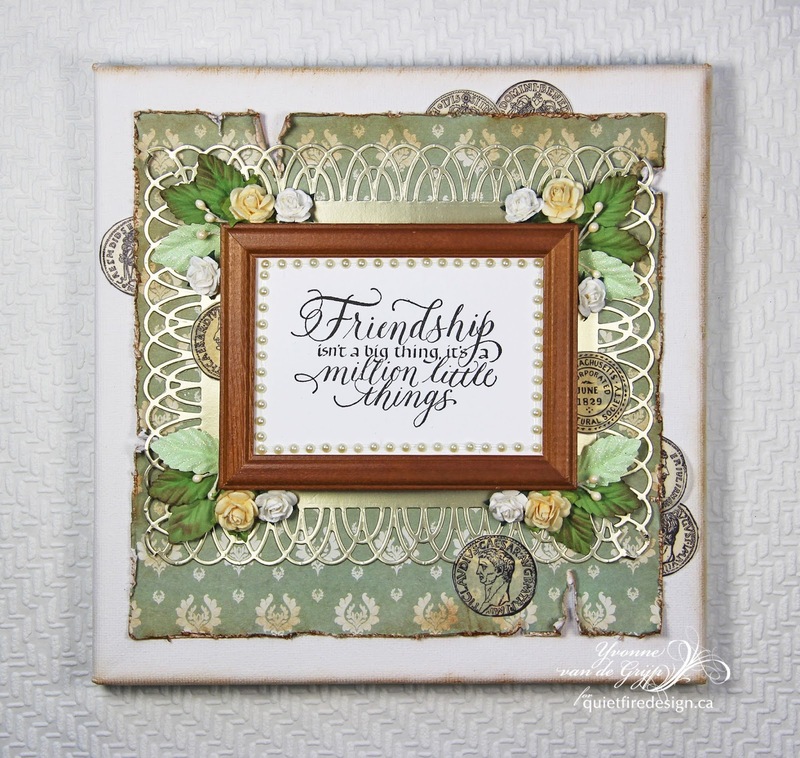 Die-cut some borders from gold cardstock and glue around the photo frame. Adhere some mulberry flowers, leaves and stamens and finish the project by adding (handcut with scissors) washi tape -coins. 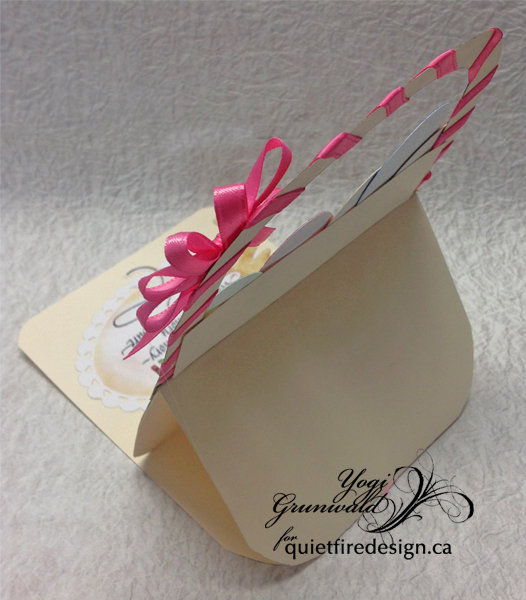 Voila...a special frame to give to a special friend! I hope you enjoyed the tutorial and wish you happy crafting! 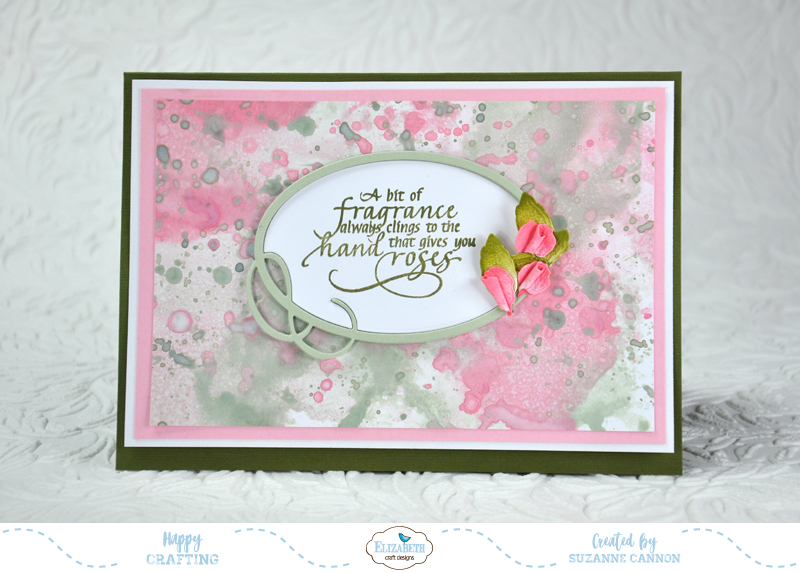 Have you ever made such a pretty background or found the most beautiful designer paper and then have trouble covering it up? 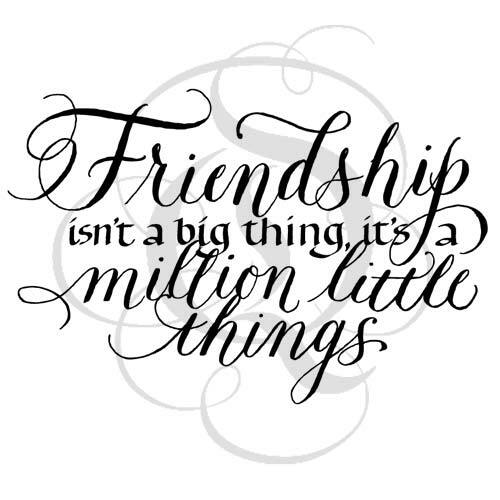 I do - all the time! 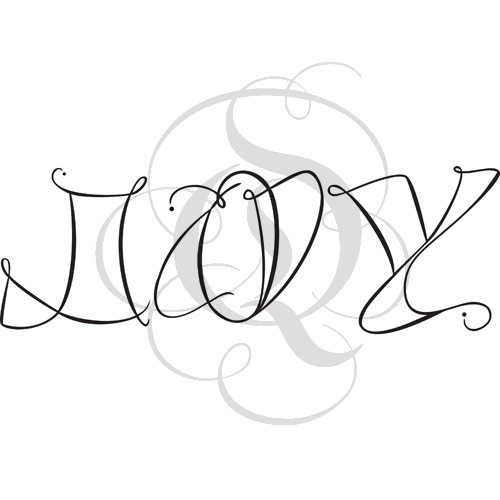 I think the best thing about word dies is how easy they are to use. I don't have to worry about losing a good amount of real estate for a sentiment because of the blank space - it can just go right on top of most backgrounds. 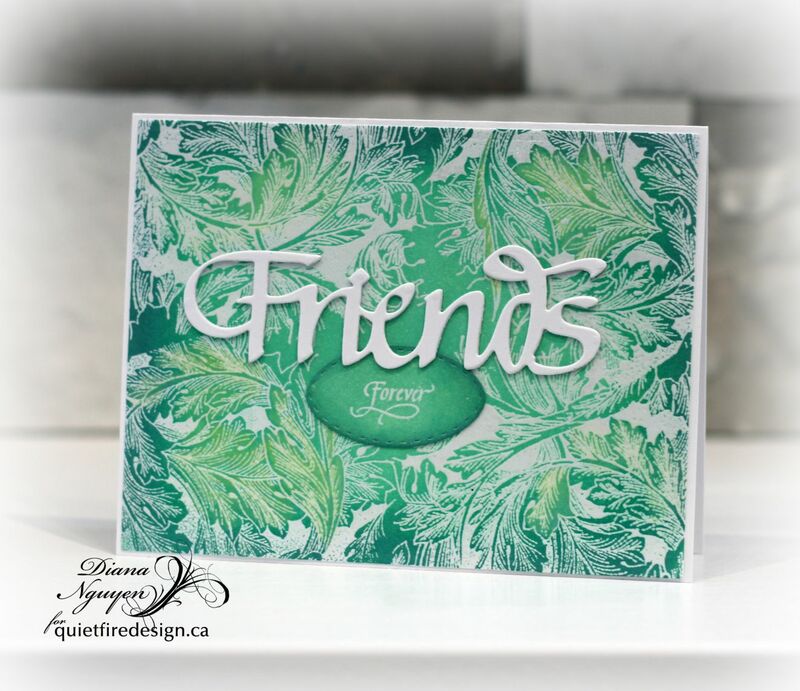 I love clear embossing and so I was playing around with the leafy acanthus background die and made this base layer by rotating the stamp and stamping in the corners. 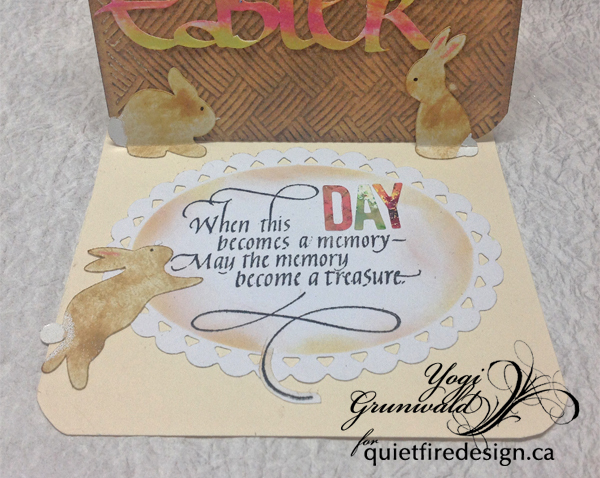 After clear embossing, I used Distress Oxide ink Lucky Clover and Fossilized Amber to bring out those beautiful lines. 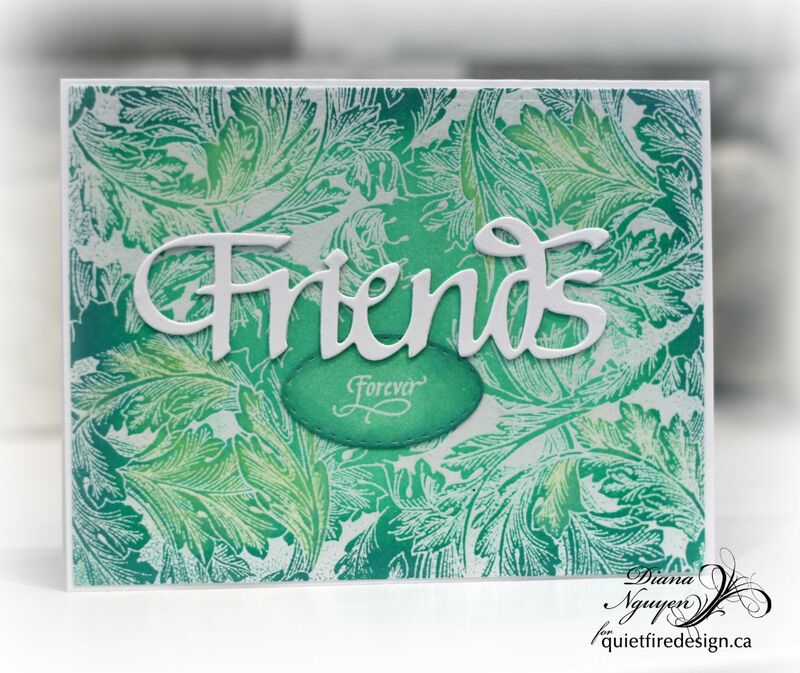 I die cut the Friends 3 times and layered them on the card. 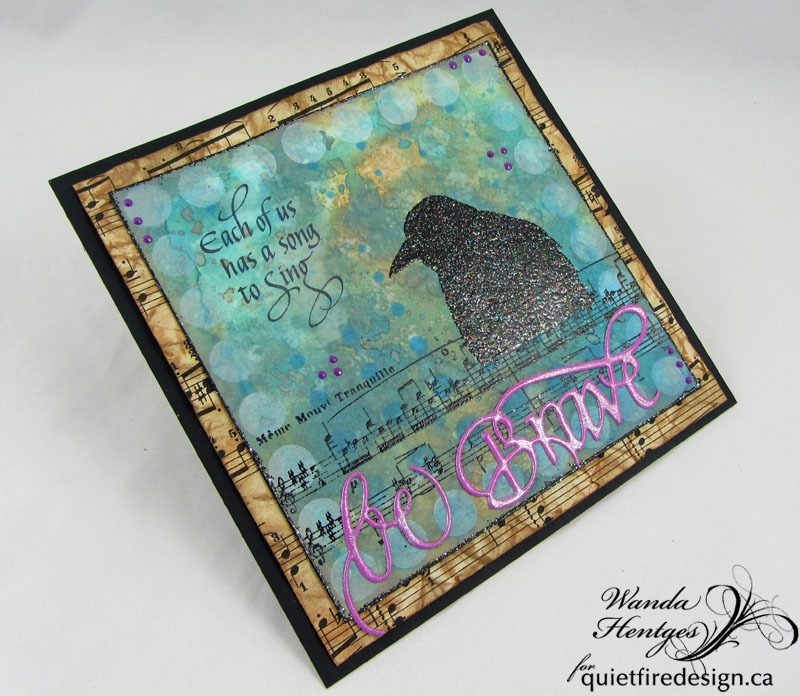 I snuck a tiny addition underneath - a small over die with Forever all clear embossed and sponged with the same ink colors. I still get to see much of my pretty background but I've also managed to get in a bold sentiment. Hope you like it! 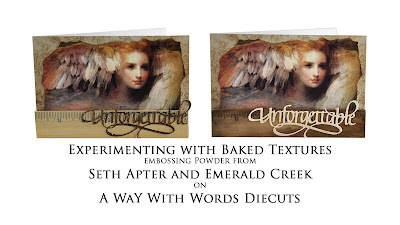 Have you seen the new Baked Texture Embossing Powders from Seth Apter and Emerald Creek? I shared a Facebook Live video from Creativation about them and now I'm sharing a new Facebook Live video of my first time playing with them! I had so much fun! 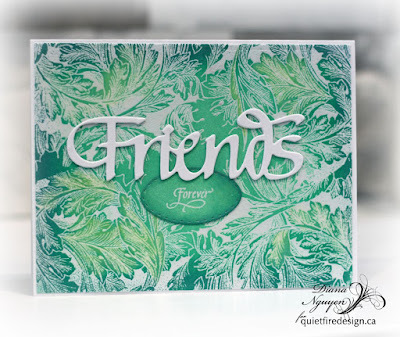 These embossing powders are mixtures of "things" - blended powders and chunks that create wonderful surfaces! 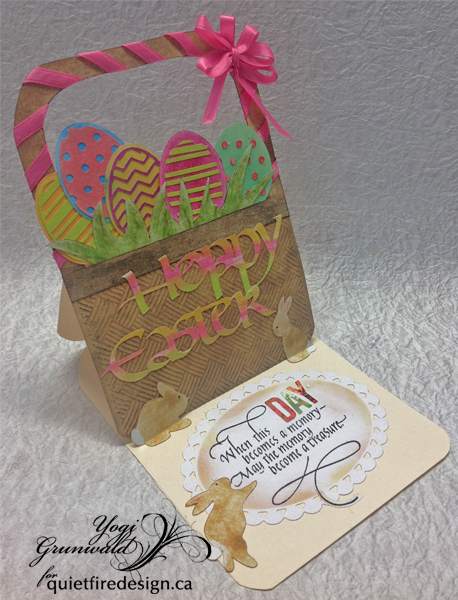 I wanted to try each of the seven powders to see which would work best on this project. I've also added the Facebook Live recording to YouTube where you can find it easily. 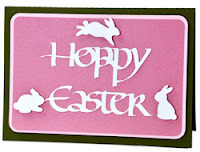 If you are receiving this blog update by email, click on the photo to view the video on YouTube. Here are some closeups of the experiments. Some things don't show their full beauty because the A Way With Words diecuts are quite fine, but the darker blends would make a fabulously rich backgrounds (more play required!). Here are some of my experiments. Hopefully you can see some of the texture in the photos! There is lots of fun to be had with these. 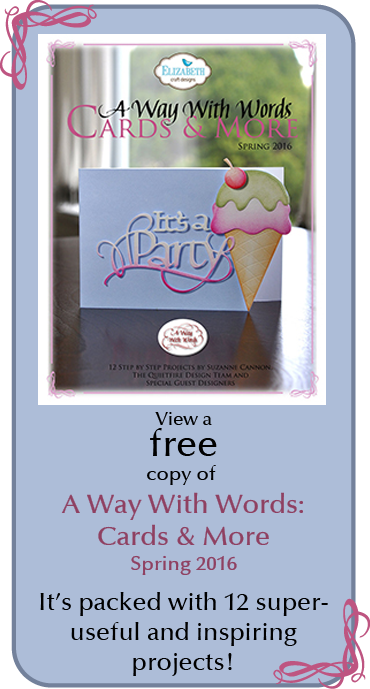 They're available from Emerald Creek and Seth Apter and probably lots of other places soon! Have fun! 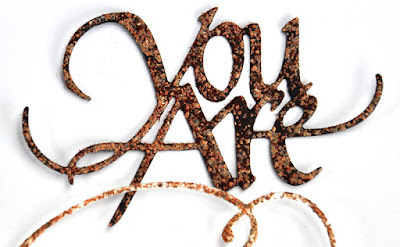 Burnt Copper Leaves - not a Baked Texture, but is totally awesome! Hello Again!!!! It's Wanda and I hope today finds you well!!! I had fun putting this project together. I started with Distress Oxide Inks onto Distress Mixed Media Heavystock paper. 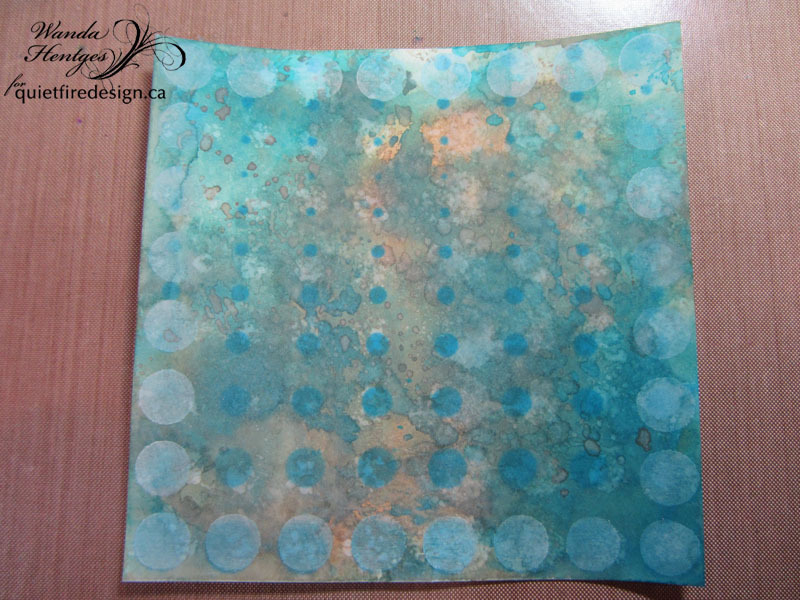 I put the inks onto a craft sheet, sprayed with water, and dipped my paper in repeating until I was happy with it. Next I did some layers of stenciling with the A Way With Words Dotty Stencil (from Quietfire Design or Elizabeth Craft Designs). 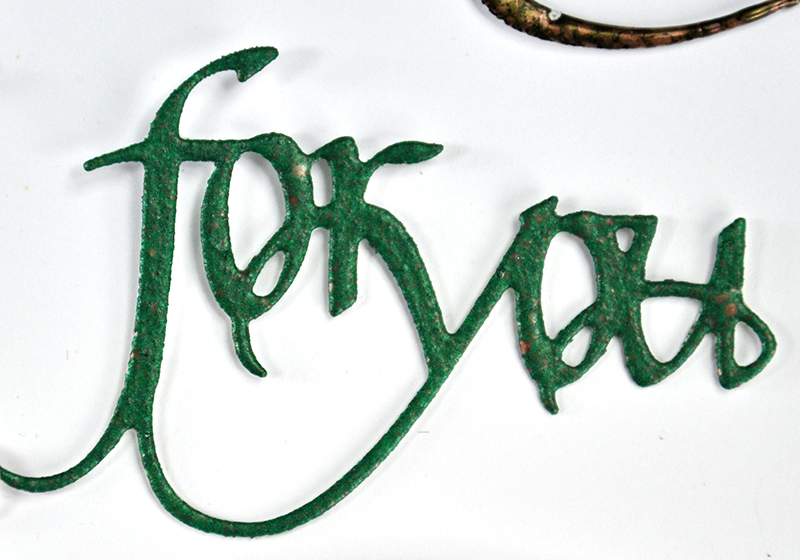 First I put the stencil on, sprayer some water, removed the stencil, blotted the paper and dried it. This left light colored circles that you can make out a bit. 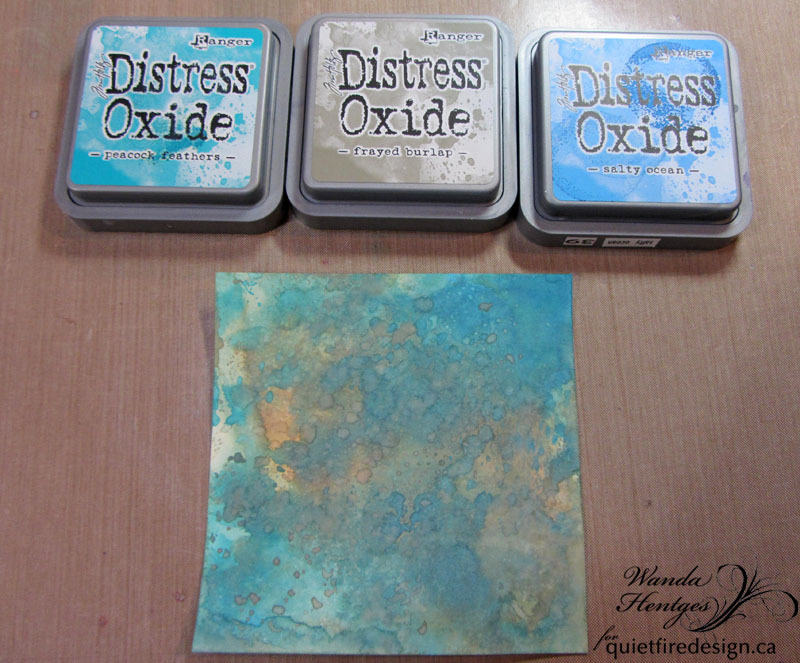 Next I put the stencil on and inked through it with Distress Oxide Salty Ocean. Finally, using just the largest circles along the edges, I inked through with Snow Cap Pigment Ink. 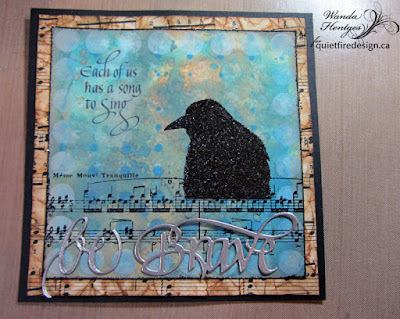 The crow and the music are both from the Crows - Set of 9 stamp set. After being sure the panel was completely dry and tapping an anti-static pad over it, I stamped the music and embossed it with Detail Black Powder. 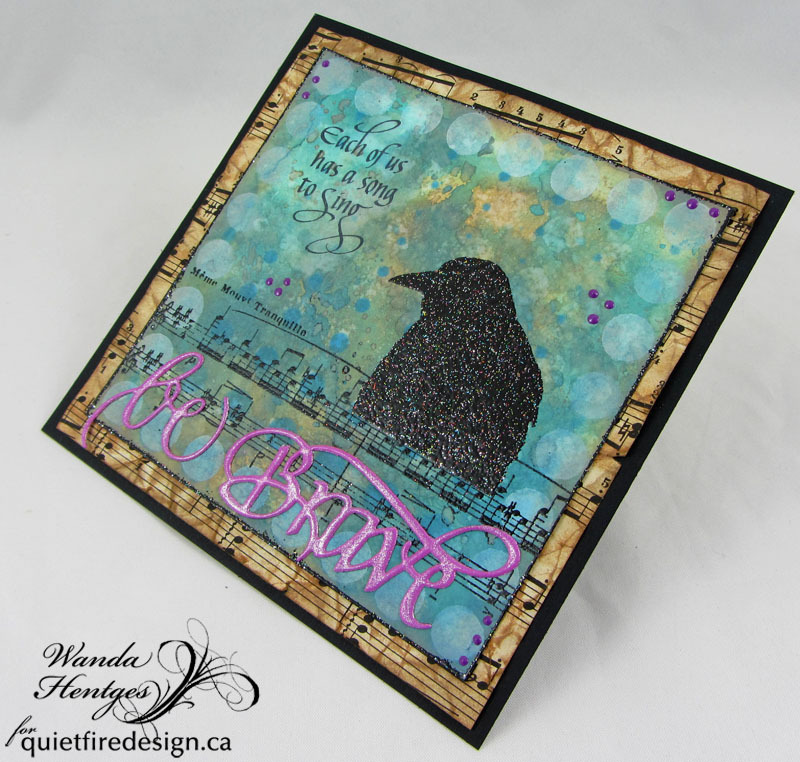 I stamped the crow and embossed it with Black Sparkle Powder. 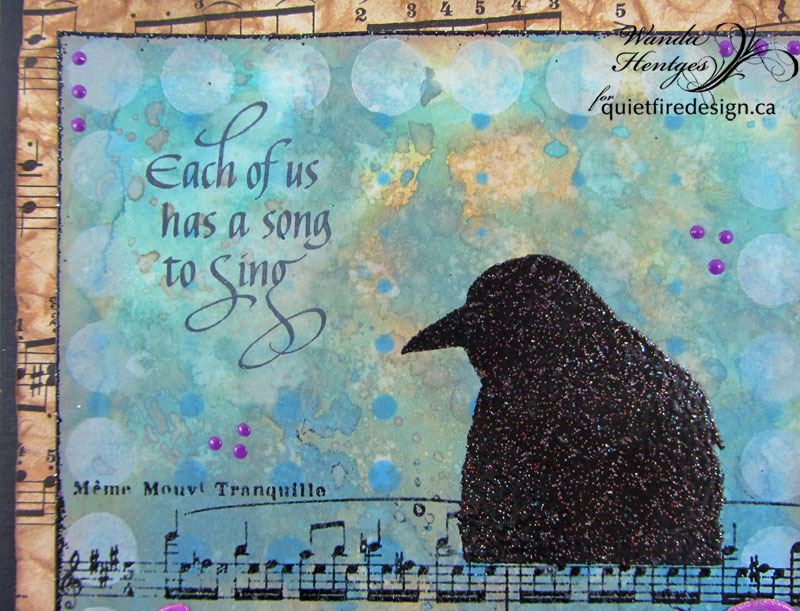 Each of Us has a Song is stamped with Archival Ink Jet Black, no embossing, and I wish I had embossed it or used a stamping platform to stamp it, but I didn't. To help it show from the background a bit better, I used a water brush to brush water over that area, blotted off some of the color, and dried it. I inked around the edges of the panel with Distress Oxide Frayed Burlap and finally embossed the edges with Black Sparkle Powder. The next layer is paper cut from an old music book. I crumpled the piece well, flattened it back out (but not too much), rubbed a Distress Ink Tea Dye pad direct to the paper, sprayed the paper with water, and dried it. 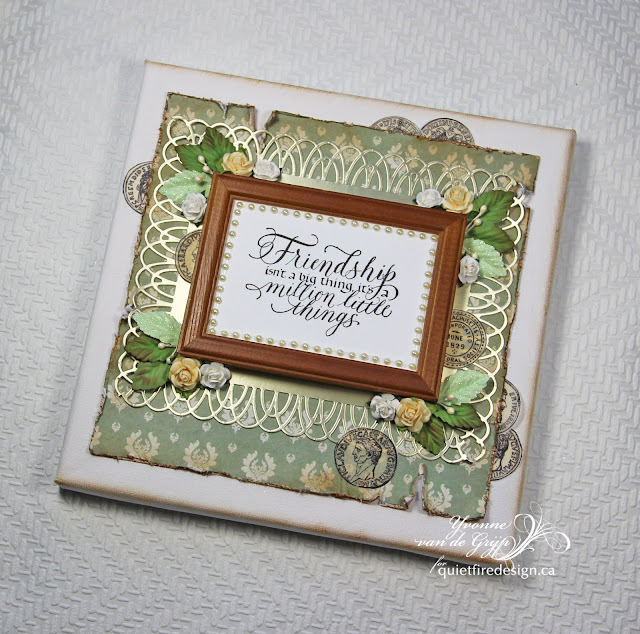 but I didn't think they stood out enough so I embossed right over the silver with Wendy Vecchi's Cactus Blossom Powder - I liked that. 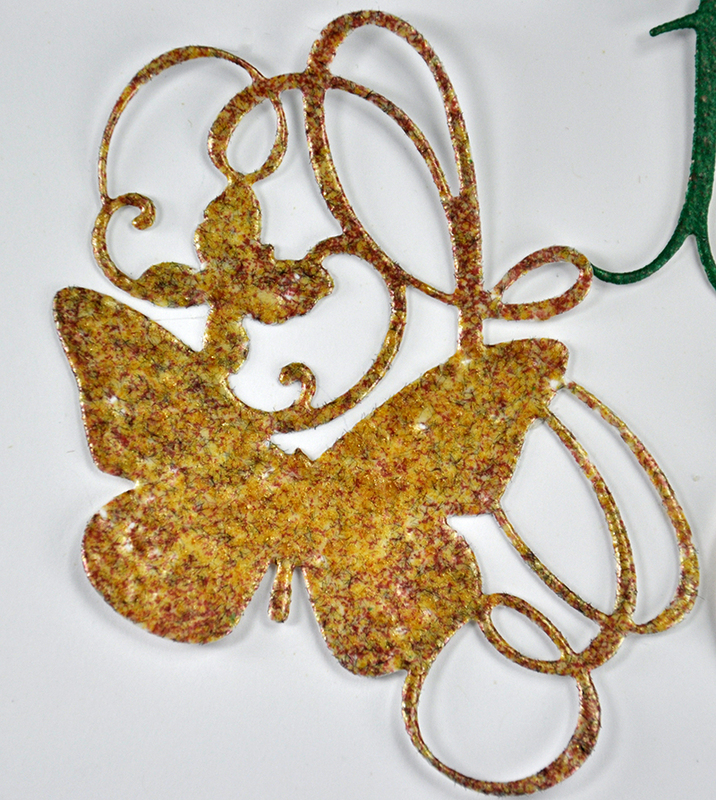 The final detail was dots of Cactus Blossom Enamel Accents. 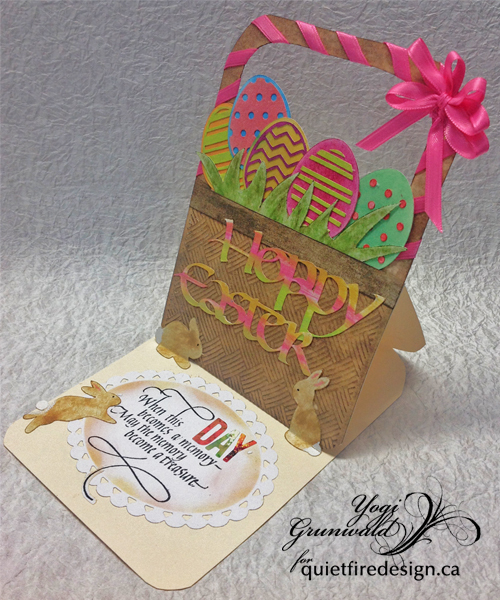 It's all attached to black cardstock. 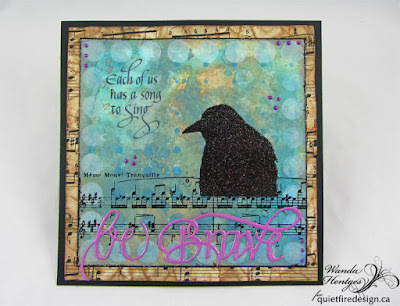 I hope you've enjoyed today's project and that you find some time to play with your inks and stamps this week. Many of you who visited the Quietfire booth in Edmonton will know my friend Susan! 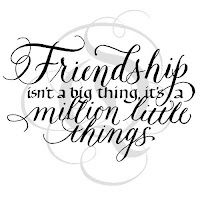 I met Susan when we both lived in Surrey, BC and our friendship has lasted through many years and moves. 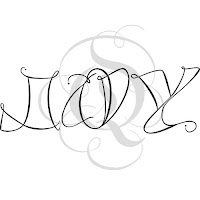 She was one of my calligraphy students and she's a very determined lefty calligrapher. 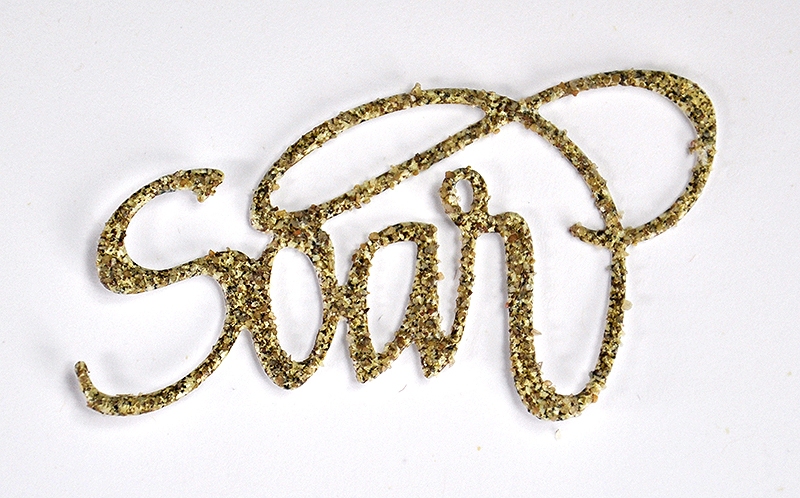 Although she's not doing as much lettering as she used to, she still loves picking up pen and paper. In the last year or so she's been Tangling. 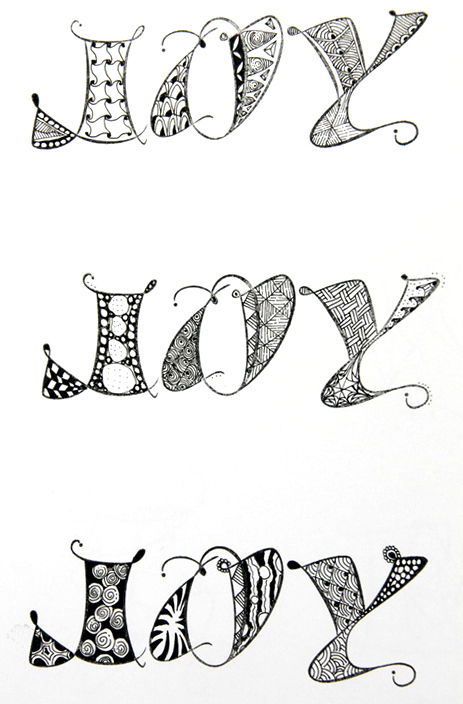 When we visited at Christmas, she showed me her sketchbook filled with tangles and Zentagles. It was amazing! So. Fill 'er Up stamps from Quietfire + Zentagle Inspired Art in Susan's hands and we get this awesome artwork! Susan stamped with Imagine Crafts StazOn ink then used a Sakura Pigma Pen to do the tangling. She says she has been inspired by the books Totally Tangled by Sandy Seen Bartholomew and One Tangle a Day by Beckah Krahula. She has also been inspired at http://tanglepatterns.com/ - I get almost daily emails from them and find it overwhelming (because I want to do it, but will need to clone myself first)! But it's a great place for inspiration. 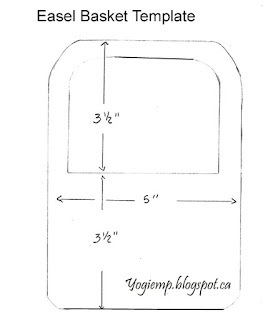 Here are all the Fill 'er Up stamps for you to tangle in. So far, there are eleven letters! Here are some more from Susan's play time! 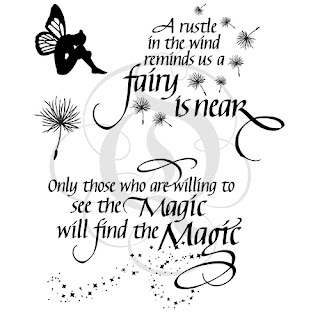 Doesn't it just make you want to get out your pen and paper? Hi and it's so nice for you to drop by and see what is new on the Quietfire blog today. It's Teresa here today with a share for all of you looking forward to spring coming in the weeks ahead. 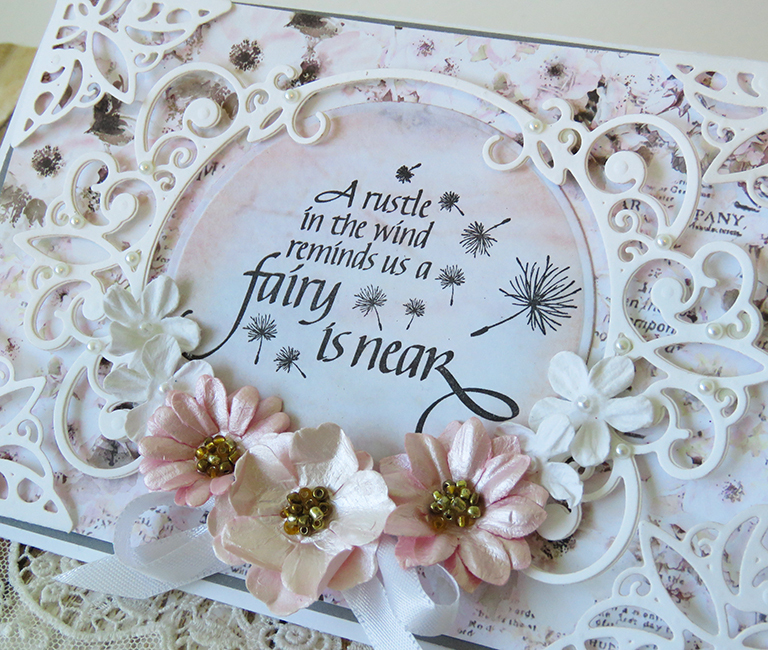 I found some brand new paper called Cherry Blossoms from Prima and i thought it was a perfect match to go with the stamp i had called "A Rustle in the Wind". This is a set of 4 stamps, 2 are sentiments and both are just adorable. 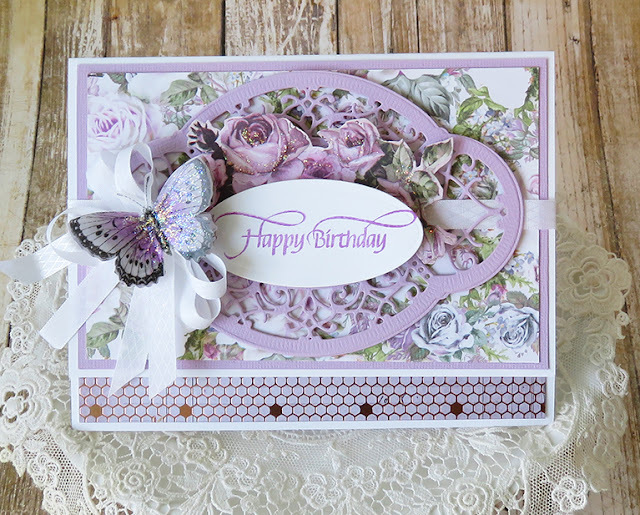 To make my card i created a simple layered backround and then added a few beautiful die cuts in white to frame the sentiment. 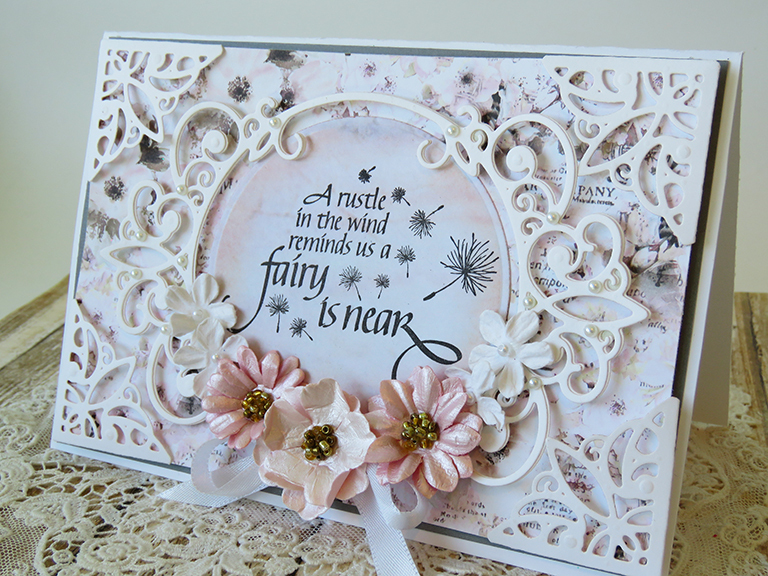 Then i added some beautiful flowers from Prima and just a few pearls to make it sparkle a little more. 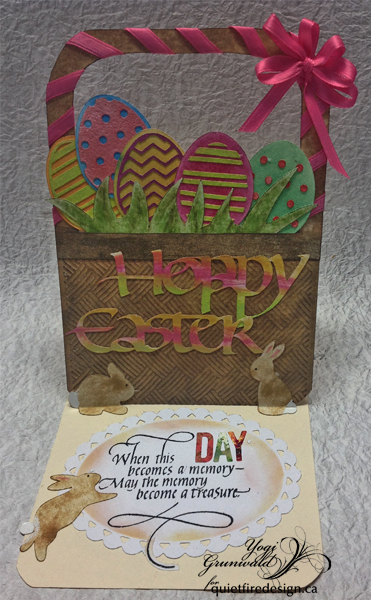 I also did a card a while back with the bottom sentiment so i thought i would attach it below so that you can have 2 ideas for this set. Its fun to add extra glitter to this one with stickles or even use some of that superfine glitter you have stashed away for something special.